The Brush tool supports two types of brush tips: Solid and Textured. Solid brush tips are plain shapes that can be used to draw vector shapes filled with a solid color, whereas textured brush tips are bitmap images with various shapes and opacity levels that can be used to create natural-looking brush strokes. Solid brush tips are not customizable. The selection is limited to either a circle, diamond or square-shaped brush tip, the proportions and angle of which can be adjusted. While Storyboard Pro also comes bundled with preset textured brush tips, it is also possible to create and use your own textured brush tips. In the Tools toolbar, select the Brush tool or press Alt + B. In the Tool Properties view, click the Arrow button to open the Brush Properties view. 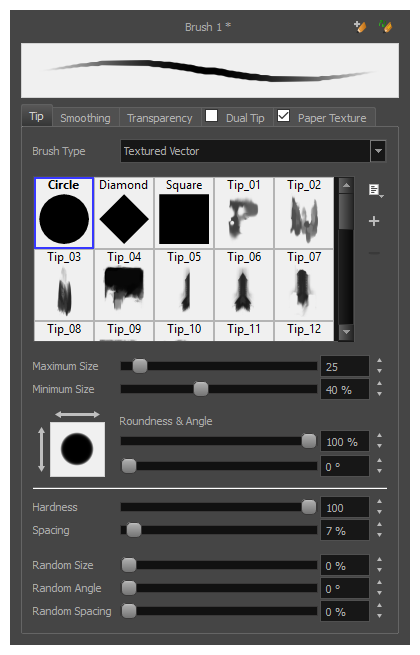 If you are drawing on a vector layer, set the Brush Type to Textured Vector to enable the textured brush options. If you are drawing on a bitmap layer, the textured brush options are always enabled. In the Brush Tip list, select the desired brush tip. If you want to create your own brush tip, see Adding a Brush Tip. Use the Maximum Size slider to set the maximum size of your brush tip. NOTE When drawing with a mouse, your brush is always at its maximum size. When drawing with a pressure-sensitive pen tablet, your brush's size will range between its minimum and maximum size, depending on the amount of pressure you put on the pen when drawing. If you are using a pressure-sensitive pen tablet, use the Minimum Size slider to set the size of your brush when using your pen with very little pressure. The minimum size is set to a percentage of your brush tip's maximum size, which is 25% by default. If you don't want the pressure on your pen to affect the brush size, set this parameter to 100%. If you want your brush tip to have uneven dimensions, use the Roundness slider to shrink the brush tip vertically all the while preserving its horizontal size. If you want your brush tip to be at an angle, use the Angle slider to rotate your brush tip. Use the Hardness slider to set how much of the outer part of your brush tip should fade to transparency. If you set it to 100 %, the brush will be completely solid. If you set it to 0 %, the brush will only be opaque in its center, and will gradually become transparent towards its edges. Use the Spacing slider to set how much distance you must drag your brush before Storyboard Pro prints the brush tip onto your canvas, relative to your brush's size. The default setting is 7%, which produces a relatively realistic brush stroke-like result. If this setting is too low, your brush strokes might feel too thick and opaque. If this setting is too high, your strokes will look like the brush tip has been stamped repeatedly over your canvas instead of dragged on it. If you want the size of your brush tip to vary each time it's printed on your canvas, set the Random Size setting to any value above 0 %. If you want the angle of your brush tip to be random each time the tip is printed on your canvas, set the Random Angle setting to any value above 0 °. If you want the spacing between each instance of the brush tip to be random, set the Random Spacing setting to any value above 0 %. In the Stage view, start drawing to test your brush settings.